Algy, Hugh Drummond's right hand man has gotten married. At the wedding Drummond (Ronald Coleman) tells Algy that his days of adventuring are over since the partners must retire together. As Drummond walks home he becomes lost in the fog and deciding to phone for help he walks up to the nearest house. Once there he finds the door open and a dead man on a divan. 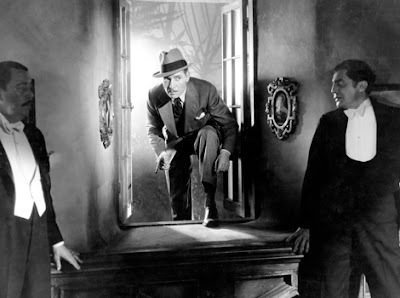 After racing to find a cop he returns to the house and finds the body gone and Prince Achmed (Warner Oland) and his group acting suspiciously. After the cop and Drummond leave together, Drummond returns to investigate where Achmed warns Drummond to leave the matter alone or die. What follows is a round and round affair through the night as Drummond attempts to rescue a damsel and get to the bottom of matters, all the while not letting anyone, including the newlyweds, sleep. Good little thriller is better once things get going about a half an hour in. Coleman is an amusing hero and his battle with Oland, particularly towards the end, is rather amusing since it leaves Oland's character completely apoplectic, something we never saw in all of the Charlie Chan or Fu Manchu films that Oland made. The film's mix of danger and comedy doesn't always work, especially when we find out what is really going on, the denouncement is much darker than some of the earlier silliness suggests, and I for one felt rather uneasy laughing at what Oland and his crew was really trying to do. A solid thriller of the sort they don't make any more, and didn't make as an A film that often after this was released. Worth a look if you get the chance.